Timelessly beautiful, this sparkling 9ct white gold diamond ring showcases a round brilliant cut cluster centre, with a halo of diamonds crafted around the band. A striking quarter carat ring that will make the ideal diamond engagement ring for that special someone in your life. 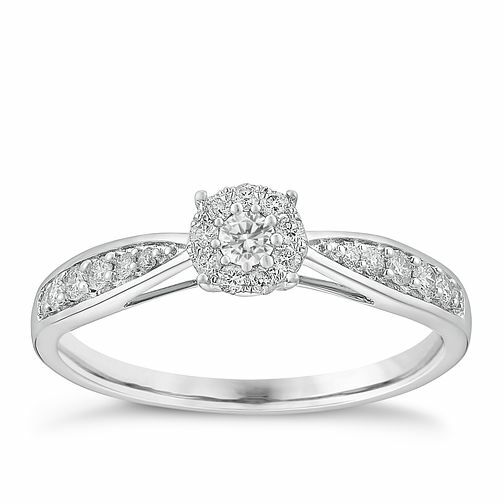 9ct white gold 1/4ct halo cluster diamond ring is rated 4.5 out of 5 by 4. Rated 4 out of 5 by Anonymous from Beautiful ring! I absolutely love my engagement ring, it really sparkles and everyone always comments on how lovely it is. However, it is only white gold plated so the bottom of the band has worn off already (got it in August 2016) Ernest Jones will dip it for free once within a year. I believe its about £40 each time after. It is still a gorgeous ring so don't hesitate to purchase!